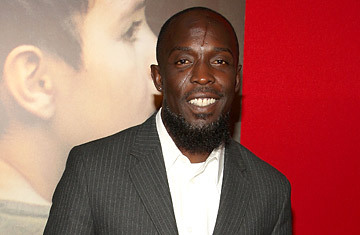 Actor Michael K. Williams attends the premiere in New York City. Michael Kenneth Williams' portrayal of Omar Little, the iconoclastic shotgun-toting stickup artist in the HBO drama The Wire, earned praise from critics, peers and gangsters alike. With David Simon's Baltimore saga wrapped up, Williams has moved to the silver screen, where he has a part in director John Hillcoat's adaption of Cormac McCarthy's postapocalytic novel The Road, in theaters Nov. 25. Next year, he'll build on that with roles in Antoine Fuqua's Brooklyn's Finest and a new HBO series helmed by Martin Scorsese. Williams talked to TIME about his early career, how he prepared to play Omar and what roles he's lobbying for next. What was it like working on The Road? It was amazing. It was a great experience to be around such high-powered talent. John Hillcoat is a great director. He knows what he wants, he doesn't overtalk it and he's very direct. He lets you do your thing. It was an honor to work on that project. Can you talk a little bit about how you got started in the business? I know you were originally a dancer. Yeah, I started as a dancer in 1991 or '92. I modeled a little bit, and I did a bunch of music videos. Once I cut my face [in a bar fight at age 25], I started getting attention from directors to play thug roles in music videos. That kind of got the ball rolling. Have you found it difficult, having played such an iconic character, to attract different kinds of roles? It hasn't been hard at all. I think what's happening is once people hear me talk, they see the talent. They realize I'm not just a guy picked up off the street. It makes them more intrigued. I haven't had a problem with being typecast, but if I was only getting one type of role, I wouldn't mind. What I'm worried about is not working. How did you wind being cast by David Simon? How different was your upbringing from the character's? Oh, extremely different. As we say in the hood, I'm a stoop kid. I wasn't allowed to go to the corner. My mother wouldn't allow that type of behavior in the house. She was very strict about that. I know nothing of what it is to be a gangster. I grew up with gangsters. I have a lot of love for my friends who grew up like that within my neighborhood. But it was clear that I was not cut from the same cloth, and I knew when to stay in my lane and not go overboard and be someone I wasn't. Did you do any particular preparation to get yourself into the mind-set to portray Omar? Yeah, I did a lot of research into what it means to be a black man in Baltimore. I wanted Omar to look, sound and feel like someone who was born and raised in Baltimore  not a New York kid trying to portray that. So I had to learn the Baltimore dialects so the writing could sound authentic. They'd write things like "Do tell?" and "How do?" We don't talk like that in Brooklyn. I thought, What does that mean? "Do tell?" That's not gangster. But in Baltimore, it is. Do you think the show, which offered such an unvarnished picture of crime and corruption, helped or hurt America's perception of inner cities? It was a very fine line that we walked. There were scenes of black-on-black violence that I was apprehensive about. I thought, Are we showing the truth, or glorifying what's wrong with the neighborhood? Did you voice those apprehensions? No, I worked through it. That was my first big job, and I needed to stay in line and not make any waves. I just trusted what they were doing. What was it like to play an iconic gay character? If you'd have told me seven years ago that this character was going to warrant this type of attention, I'd have said get the hell out of here. But the fact that this character has been so well received has been humbling. It's an honor to be a part of something so beautiful and so revered within the industry. Did you have any problem reconciling that aspect of the character with your own views or those of friends? No. I was like, I made my choice, this is what I'm doing, and if you don't support it, I understand that. I wasn't going to have any bad feelings if anybody did. They have a right to their opinion. What kind of roles would you like to take on in the future? My dream role is to portray someone like James Baldwin. I've always been a fan of his writing, and I feel like he's one of our unsung heroes. He's been pretty much forgotten, and I think he needs to be recognized. He had to go all the way to Europe to find recognition and acceptance, and I'd just like to bring him to the forefront. It's a fresh story. See TIME's write-up of The Wire on the top 10 TV shows of 2008.